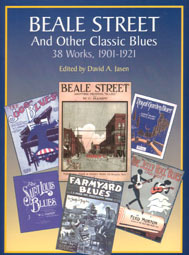 Original Sheet Music for 38 classic blues songs from 1920 through 1921. Included are "The St. Louis Blues", The Jelly Roll Blues", "Beale Street', and other classics of the era. Most have lyrics, but a few instrumentals are included.